Prolactin causes milk secretion in pregnant women after child birth. Luteinizing hormone (LH) and follicle-stimulating hormone (FSH), which regulate ovulation and estrogen and progesterone production in women, and sperm formation and testosterone production in men. Pituitary adenomas are typically benign, slow-growing tumors that arise from cells in the pituitary gland. 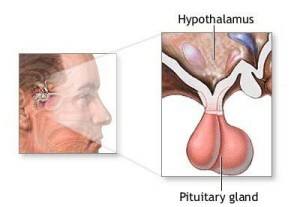 Pituitary adenomas are relatively common, occurring in 1 out every 1000 adults. 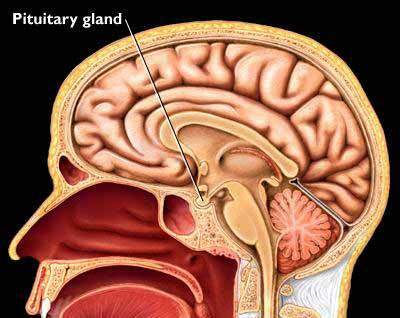 Most pituitary tumors are benign and are called adenomas. Large pituitary tumors can compress the normal pituitary gland and cause pituitary failure. This is why is it important to obtain a complete evaluationof pituitary function if a pituitary tumor is diagnosed. Prolactin-secreting pituitary adenoma (Prolactinoma): over-production of prolactin by the pituitary tumor causes loss of menstrual periods and breast milk production in women. Growth hormone-secreting pituitary adenoma: excessive growth hormone (GH) production causes acromegaly in adults or gigantism in children. 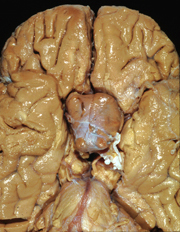 ACTH-secreting pituitary adenoma: excessive ACTH hormone produced by the pituitary gland causes Cushing’s Disease. When large pituitary adenomas (“macroadenomas”) grow upward, the tumor can elevate and compress the optic chiasm. Compression of the pituitary stalk, the structure that connects the brain to the pituitary gland, can cause a mild elevation in the hormone prolactin. This can cause irregular menstrual periods. It is important to distinguish “stalk effect” from a prolactimnoma. Pituitary adenomas can suddenly bleed internally, leading to an abrupt increase in size. In other cases, the tumor can outgrow its blood supply, leading to swelling of the dead tissue. Pituitary apoplexy generally presents with sudden onset headache and visual loss, and is a surgical emergency.